As you look outside, you see more snow falling and you feel the temperature getting colder every day. You’re concerned with cleaning off your car and getting shoveled out; buying a home may not have even crossed your mind. 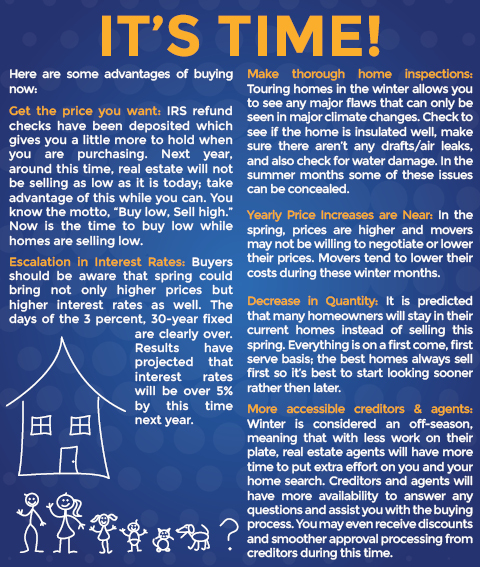 Many argue that spring is the best time to find your dream home, but if you are ready, The Time is Now! AskHomesale.com provides real estate advice and information for home buyers, home sellers, and homeowners alike. Askhomesale.com is part of the Prudential Homesale Family. The Homesale Family of Companies is the leading real estate company serving the Baltimore, Maryland, South Central and Southeastern PA real estate markets. Prudential Homesale has more than 25 offices with over 1,000 REALTORS®. Prudential Homesale’s footprint includes Maryland real estate offices in Baltimore City, Federal Hill, Fells Point, Westminster, and Timonium. Pennsylvania real estate offices include York, Lancaster, Wyomissing, Chambersburg, Gettysburg, Harrisburg, and Schuylkill Haven.